We chat to personal chef Franck about creating delicious French inspired food for events and parties. 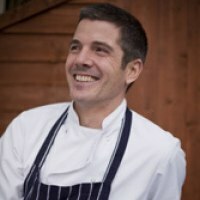 Franck is a French chef who cooks for individuals and small parties at a venue of their choosing. We asked him to share some of his experiences and he tells us about some of the events he’s catered for and how he once helped organise a marriage proposal for one of his guests. I was working in a restaurant in Cornwall at the time and one day a friend of mine asked if I could do some in house catering for some guests. Then I said to myself, why not, it’s different and could be fun. And here I am five years on. What I like the most about what I do is that it’s completely different from booking to booking. I get a new road trip, I get to see new properties, I get to meet new people and make sure they have the best of local produce. I have so far catered for honeymoons, anniversaries, birthdays, hen parties, Christmas dinners etc… and the best bit of all being that I am not stuck within four walls all day. The team is very simple; it’s a one-man team. I have a waiter that helps me when need him and also my partner / wife to be, helps out too. Do you have any interesting stories or things that have happened? The most interesting one was when someone asked me for ideas on how to propose to his girlfriend. It was quite fun to organise everything. And he did let me know her answer, she said YES. Worked with any celebrities/famous clients? Yes, I did cook for a famous novelist. I didn’t know who she was initially (oops) she was very nice and down to earth. And I got rebooked to celebrate her birthday which was great. I have started pop up restaurants in local cafes, which I am really enjoying. I hope to have these in several venues near to where I live and perhaps look at fundraising dinner parties too, to help the community. I have found it very easy to use and the part I like the most is that it is all in one place and easy to submit interest in events that have been listed. The bookings I have had through Add to Event have been with great people so far and been fun to cater for. Yes, I would definitely recommend to others. Franck is a great example of an experienced chef using Add to Event as a new avenue for finding clients. If you are a chef or catering service and are not yet a member of Add to Event please join today and let us help you find new business opportunities, just like Franck.